Jayne is an award-winning travel blogger and social media specialist on a mission to blog 40 countries before turning 30. Follow her on twitter @jayneytravels. Downtown Las Vegas has undergone a dramatic makeover during the last few years and is re-emerging as the stylish side of Sin City. Visit some of these Downtown hotspots to see a trendier side to Las Vegas. Neon signs from Vegas’ past have been salvaged in the Neon Museum’s impressive collection of Strip memorabilia. During the one hour guided tours, which are included in the entrance fee, visitors are taught about the production and restoration of the Boneyard’s innovative neon signs as well as the history of the businesses, hotels and casinos they belonged to. Walking the Boneyard feels like you are stepping into a Vegas themed comic strip as you are surrounded on all sides by the giant signs that used to line the Strip. A sign from the venue of Elvis’ first gig sits next to golden nuggets, Caesar’s face and Aladdin’s lamp. The museum itself is a relic of the past as the Neon Museum’s entrance hall is the reclaimed lobby of La Concha motel, built on Las Vegas Boulevard in 1961. Cleverly, the typography used in the street sign for the Neon Museum is an homage to some of the famous names contained in the Boneyard. As well as offering an interesting look at Vegas’ history the Boneyard makes a stunning backdrop for retro-inspired photoshoots. It’s particularly popular with Vegas newlyweds looking for an alternative wedding album. Vintage Vegas signs are not just confined to the Boneyard. As part of the National Scenic Byways “Neon Signs” project some of the city’s glitziest signs have been lovingly restored and are now dispersed throughout the Downtown area. 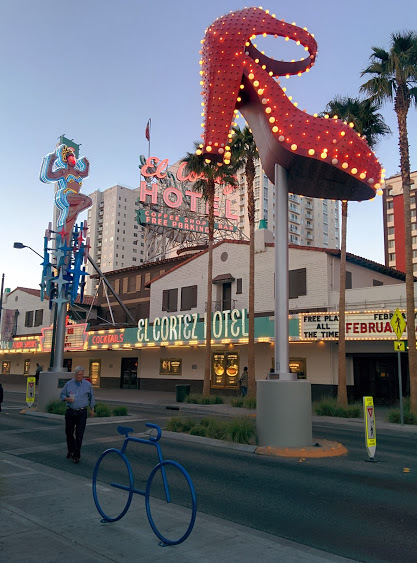 Spinning high heels (from the Silver Slipper Casino), bucking horseman (the Hacienda Horse and Rider) and signs for motels long since closed down (like Lucky Cuss), line Fremont Street and make you truly feel like you are taking a walk down memory lane. Fremont Street is famed, however, for the nightly light shows it holds on the ceiling of the pedestrian mall. Fremont Street’s covered walkway boasts 12.5 million lights and, together with 550,000 watts of sound, comes alive in a spectacular free show. Fans of retro fashion will find they have a lot to choose from in the stores of Downtown. On Main Street you can find an array of vintage clubbing attire at Better Than New, whilst Retro Vegas has all the vintage furniture you could want to decorate the home. The area is also home to antique stores and pawn shops, which are great places to find unique Vegas souvenirs such as old casino chips and retired slot machines. 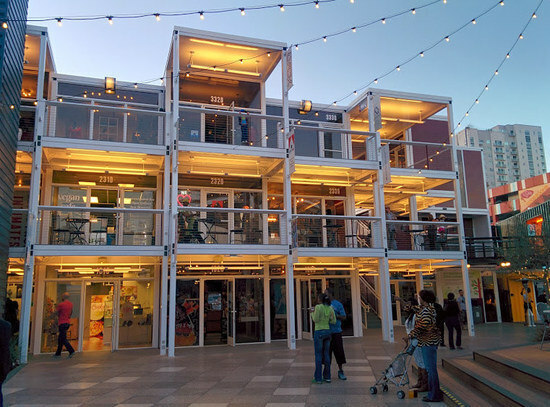 At the Downtown Container Park independent boutiques are housed in old shipping containers and, together with the children’s play and live music areas, it makes a great location for a family day out. The newest addition to the Downtown hotel and casino scene is the super stylish Downtown Grand. Chic bedrooms at the Downtown Grand are accompanied by an array of restaurants, including the Latin-influenced Commissary and modern-American Stewart & Ogden (decorated like a 50s diner but with chandeliers and comfy chairs.) The best thing about the Downtown Grand, though, is its hip, grass lined, rooftop pool - the only one in this part of town. 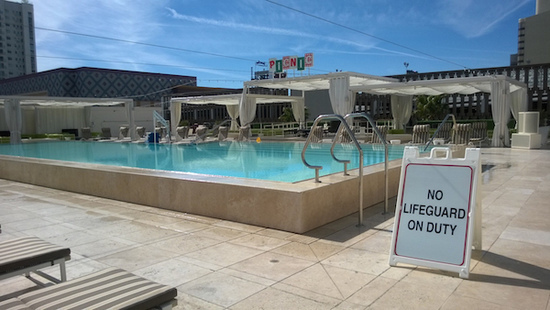 Guests of the hotel are welcome to take a dip - non-hotel guests may buy a pool day pass starting at $15. Although there are shops and sights that demand attention on the Las Vegas Strip, if you want to see a stylish side of Vegas, you need to head Downtown.